Fancy having a go at making a stunning Christmas garland? It's easy peasey. It will turn out just like the gorgeous one shown below, well maybe in a different colour, but the same. There are lots of these garlands shown on Pinterest at this time of year. I made one last year as I had some spare baubles knocking around and I absolutely loved it. It took pride of place above my dining room window and it's back there again this year. So, I decided I also wanted one for the lounge, in silver. So here's me stringing mine together, because, really that's all there is to it. No rocket science, no hard work. Some people use a floristry wire or ribbon but to be honest I've just used the ribbon you use to tie around your presents to make them look all pretty. It's just as good and because it's thin, unlike ribbon it threads through the holes easily. Use a selection of baubles, large, small, shiny, glittery to make it pop a little. To be honest you can use the really cheap baubles, nothing fancy needed, they do look just as good, and it's the best way because you do need quite a lot. Let's face it no-ones going to be getting up close to examine them are they. I laid mine out on the floor so I could get a feel for the size of the finished product and by doing this you 'place' a good mixture of baubles along the garland. Snip off the string thats used to hang them on the tree as you don't need that. Thread the ribbon through your first bauble and then tie a knot to secure it in place. Leave yourself spare ribbon on the end so you can make hanging loops. You can then pop on the rest of them. This is the most tedious bit but the result is worth it. In ten minutes I was done! You can obviously make it as short or as long as you want. 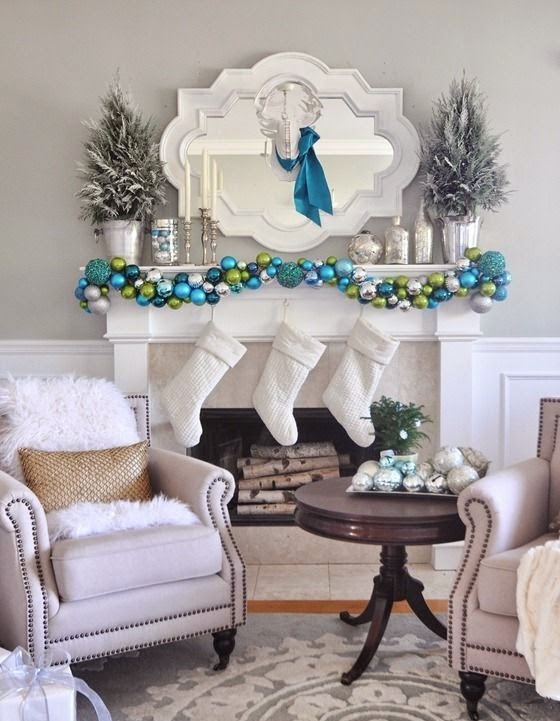 I like to make mine quite chunky as it's hanging on the wall but if you're making it for your fireplace, you can thin the baubles out a little, which means you won't have to use as many, or you can just have an extra long one! If you're hanging it, make yourself some loops on either end of the ribbon so you can hook up on tacks or hooks. Ta-dah! Finished garland in place. I do wish I'd have made this slightly longer but they were all the baubles I had. I'm happy with it though, just not loving it as much as the red one in my dining room. I'm really pleased I used the berry baubles in this one, alongside the shiny and the matt. Super easy, fairly cheap and they look like the professional ones that decorate our shopping centres and malls at this time of year. No doubt I'll be knocking up another next year in a different colour! I am going to the shops straight after Christmas when they are selling off the decorations to stock up on tonnes for next year! Do you make any Christmas decorations at home?